On our first night in Montana we went to an authentic rodeo complete with bucking broncos, big mean bulls, cowboys, cowgirls, colorful clowns and a sea of ten gallon hats. This rodeo was the real deal. This image may be my favorite of many wonderful shots that I made that evening. The essence of the rodeo and the west is captured in this photograph. 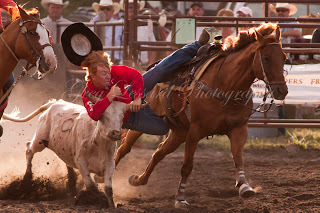 The cowboy captured in mid-air, his hat flying off in the background, and the steer's hooves locked into the ground in a desperate attempt to escape, all hint at the wild energy of the rodeo. 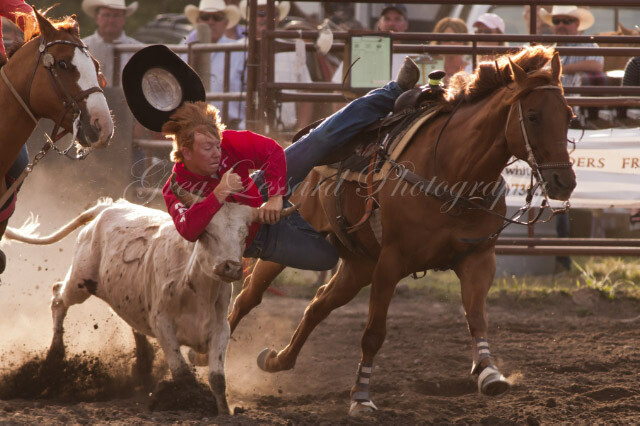 Few things represent the cowboy tradition of the west better than a small town rodeo. Cowboys and cowgirls came from all over Montana and Canada to compete in the contest. Some of them may not have been old enough to finish the 6th grade, while a few were old enough to potentially be great grandparents. Young and old, they all shared a fire in their bellies for the thrill of the ride. Many of the rides, whether on a bull or from a horse started with a gut check and a quick prayer finished with a sign of the cross made for protection. Then the excitement would build as the rider exploded out of the gate as if a cannon had fired. Within seconds the ride would be over and the crowd would cheer to congratulate the rider for his or her courage. Watching these events with the naked eye is fascinating, even exhilerating. Seeing them afterwards as snapshots brings about an even greater appreciation for the effort and courage that these modern day wranglers display. The still shots show the raw power that the broncos and bulls are capable of. Even an event like barrel racing is fraught with danger. Twice, riders trying to cut corners too hard in an effort to shave seconds off of their time, managed to topple their horses to the ground. I was particularly impressed by the cowgirl who remounted her horse and finished the race, even though there was no chance for her to win. That type of hard nosed attitude prevailed throughout the evening as rider after rider attempted to tame the beasts to which they were bound. If you find yourself out west, be sure to find the local rodeo. You won't regret it.